The 2018 General Election is fast approaching! Here are some helpful reminders as the November 6 General Election draws near. The deadline to register to vote for most North Carolinians is this Friday, October 12th. The deadline has been extended to Monday October 15 for the 28 counties most affected by Hurricane Florence. To find out your county’s deadline, you can go here. If you wish to check your registration status, go to the Voter Search page on the State Board of Elections website. •You can download the form here. If you do not have access to a printer, the form is available for free at the NC State Board of Elections office, County Board of Elections offices, public libraries, public high schools or college admissions offices. •County Board of Elections locations can be found here. •If you are mailing your form, the postmark MUST be on or before the deadline for your county. One Stop Early Voting starts in just one week! Voters will be able to vote early from Wednesday, October 17 to Saturday, November 3. A list of locations and times in your county can be found on the State Board of Elections website. If you miss the deadline to register, you can register to vote in person during the one-stop early voting period. For more information about this process, see “Same-Day Registration” on the State Board of Elections website. 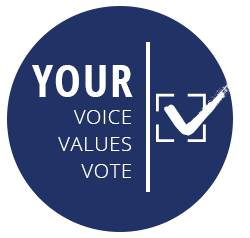 Now is a great time to order NC Family Voter Guides in bulk to distribute in your church, community organization, and neighborhood. You can also get your own personalized Online NC Family Voter Guide at NCFamilyVoter.com. Please consider emailing the link to people in your address book and promoting it on Facebook, Twitter and other social media sites. Whenever you choose to vote this election season, please take family and friends with you! How we vote will affect public policy for families across the state and nation for many years to come!